Since the amount disclosed in income chargeable under the head salaries is less than 90% of Salary reported in TDS 1, please ensure to fill details in Others in Exempt Income – an error that many of salaried tax payers are facing while filing their income tax returns. In this post we tell you why you get this error and the way around. This error occurs when your gross salary as reported by your employer in Form 26AS is higher than the one quoted by you from Form 16 while filing your tax return. The above salary in the header “Income chargeable under salaries” is Gross salary (as can be seen in the Form 16 Part B below) but while filing your return, you need to put only your Net salary. Learn: How to fill Salary details in ITR? Like in this case the Gross Salary is Rs 15,86,610 and net salary is Rs 13,12,938. The percentage of Net to Gross salary is 83%. Since this is less than 90%, you get the error. The error is easy to correct. All you need to do is report your tax-free allowances in the exempt income section. This can be done as follows for ITR 1. If you notice there are several headers under exempt allowance, which you can choose as per your requirement. Below is the list of exempt allowances header in ITR 1. 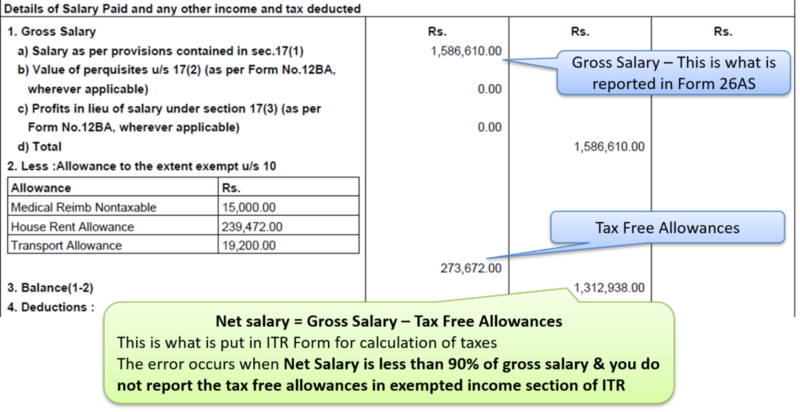 I hope this post would help you to understand and resolve the error in ITR “The amount of salary disclosed in Income details/Part BTI is less than 90% of Salary reported in Schedule TDS1”. Can I file last year Income Tax Return AY 2018-19? Straight to the point. Thank you! Ads are annoying in the middle of the content. Please see if this could be improved. I am still getting the same error after filling the details in exempt Income others. Apart from salary, in TDS 2 section bank details is already updated with the income or interest. Again do i need to fill the exempt income information as the same. If yes then should we need to enter tax amount or interest amount in any listed category? How can get to know the details of “Allowance to the extent exempt u/s 10”, as only the amount is mentioned in my Form 16 without any details. But my Gross salary in Form 16 and Form 26AS is different in that what i need to do. If i fill that Exempt income after that i don’t get error. But I don’t understand why the Gross Income in Form 16 and form 26As is different. Now i dont get any error but is there any possibility that i will need to pay extra tax after that. Thank you so much for publishing this helpful article. It’s very useful for me. Accurate guidelines provided in this blog.. Thank you very much. I could be able to submit my return today which was pending since 15th July 2018. Thanks Amit. It really helped. Every nice post. I saved 4000 INR. Thanks….